Objective To determine whether measuring monoclonal bands (M component) in serum should be part of the investigation of patients referred to osteoporosis clinics. Design Retrospective, cross sectional, observational study. Setting Referral centre for osteoporosis in a university hospital, Denmark. Participants 799 people (685 women) aged 19 to 94 years newly referred with suspected osteoporosis. Main outcome measures Proportion of patients fulfilling the Nordic Myeloma Study Group definition for target condition and proportion of patients with other important haematological conditions. Results 4.9% (18 of 366) of patients with osteoporosis and 2.2% (9 of 408) of patients without osteoporosis had M component in serum (χ2 = 3.66, P = 0.04). Multiple myeloma was diagnosed in three patients with osteoporosis (absolute risk 0.8%, 95% confidence interval 0.11% to 1.7%). The relative risk of multiple myeloma in patients presenting with osteoporosis was 75 (10 to 160). As a diagnostic test for multiple myeloma in patients with osteoporosis, M component in serum had a specificity of 95.0% and a positive predictive value of 17.6%. 122 blood electrophoreses were carried out for each case of multiple myeloma diagnosed. All patients with multiple myeloma had a history of fragility fractures. If lymphoma was included as a target condition, the specificity increased to 95.3% and the positive predictive value increased to 23.5%. Monoclonal gammopathy of undetermined significance was diagnosed in 13 (3.6%) participants with osteoporosis and in eight (2.0%) participants with normal bone mineral density or osteopenia. 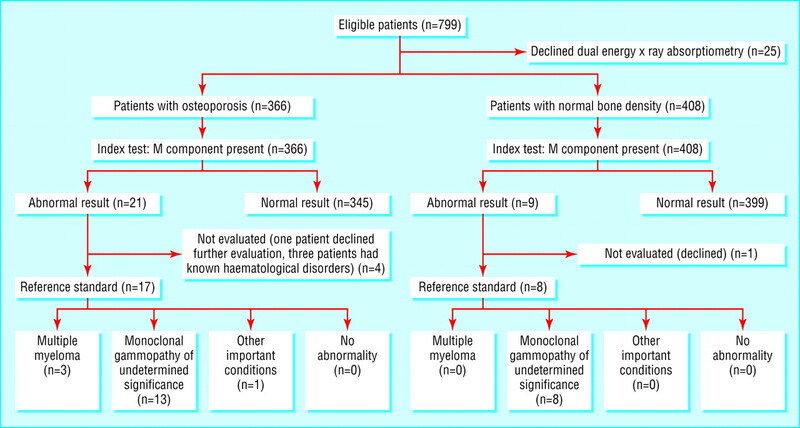 Conclusions Patients presenting with osteoporosis should be tested for M component in serum, as 1 in 20 patients with newly diagnosed osteoporosis had multiple myeloma or monoclonal gammopathy of undetermined significance. Osteoporosis is a common disease—a 50 year old white woman has a lifetime risk of 16% for hip fractures, 15% for forearm fractures, and 32% for vertebral fractures.1 About 20-40% of patients have a secondary cause of osteoporosis. The investigation of patients presenting with suspected osteoporosis differs between countries and between clinics within each country. National guidelines in Denmark do not advocate the routine measurement of monoclonal bands (M component) in the serum or urine of patients presenting with osteoporosis. In the United States, the National Osteoporosis Foundation3 lists protein electrophoresis among tests that could be carried out in patients where a specific secondary, treatable cause of osteoporosis is being considered. The extent to which protein electrophoresis is used routinely is unknown. One survey in the United States found that three out of four bone specialists would refer men with hip fractures for protein electrophoresis.4 We determined the prevalence of multiple myeloma and monoclonal gammopathy of undetermined significance in unselected patients newly referred with osteoporosis to assess whether measurement of M component should form part of the investigation of patients with suspected osteoporosis. From March 1999 to March 2001, 1372 patients (1150 women) were referred to our clinic with suspected osteoporosis or osteopenia. The clinic receives all referrals of patients with risk factors for osteoporosis from general practitioners, hospitals, and specialists in a catchment area of 473 000 people. We retrospectively evaluated all first referrals from primary care (n = 799) consecutively by a diagnostic schedule, which included measurement of serum M component and dual energy x ray absorptiometry. The study population consisted of 114 men, mean (SD) age 61.5 (14.0) years (range 19.0 to 89.0 years), and 685 women, mean (SD) age 61.0 (12.0) years (range 20.0 to 94.0 years). Overall, 26% of the participants were aged over 70, 13% over 75, and 5% over 80. Participants presenting with M component in serum underwent follow-up investigations, including bone marrow examination and skeletal x rays. Multiple myeloma was diagnosed according to the Nordic Myeloma Study Group definition.5 Briefly, the diagnosis was made on the basis of a monoclonal band in serum in excess of 30 g/l (IgG), 20 g/l (IgA), or any level of IgD or IgE monoclonal bands or a urine monoclonal band of kappa or lambda in excess of 1 g/24h. This must be accompanied by osteolytic bone lesions or by more than 10% plasma cells in bone marrow aspirates (or plasmacytosis in soft tissue or skeletal tissue biopsies). A diagnosis of multiple myeloma can be made in the presence of lower monoclonal band concentrations in serum or urine, however, if both osteolytic lesions and high plasma cell content of bone marrow aspirates are present. Patients were considered to have monoclonal gammopathy of undetermined significance if malignant monoclonal gammopathies were excluded (multiple myeloma, Waldenström's macroglobulinaemia, non-Hodgkin's lymphoma, or other lymphoproliferative disorders). The index test was for serum M component, assessed using cellulose acetate electrophoresis. This method is less sensitive than the more recent high resolution agarose gel electrophoresis. Urine tests were not carried out. We calculated confidence intervals using the normal approximation to the binary distribution, and we compared proportions using χ2 tests. Anaylses were carried out in SPSS version 10.0. We considered a significance level of 5% as important. Osteoporosis (T score less than −2.5)6 was diagnosed in 45% (n = 308) of the women and 55% (n = 63) of the men. Twenty five (3.1%) of the referred patients declined dual energy x ray absorptiometry. Thus serum M component was evaluated in 366 participants with osteoporosis detected by densitometry and 408 participants with normal bone mineral density or osteopenia. Overall, 30 participants (3.8%, figure) had a positive index test result. At subsequent visits, three patients with a positive index test result reported that they had a known haematological disorder and another two patients declined further examination. M component was present in 4.9% (n = 18) of patients with osteoporosis and 2.2% (n = 9) of patients without osteoporosis (χ2 = 3.66, P = 0.04;table 1). Although erythrocyte sedimentation rate was not routinely assessed, six of eight patients with M component had an erythrocyte sedimentation rate of 20 or lower. Multiple myeloma was diagnosed in three patients with osteoporosis (absolute risk 0.8%, 95% confidence interval 0.11% to 1.7%; table 2) but in no participants without osteoporosis. One patient with osteoporosis had a diagnosis of non-Hodgkin's lymphoma. We diagnosed monoclonal gammopathy of undetermined significance in 13 (3.6%; table 3) of the participants with osteoporosis and eight (2.0%) of the participants with normal bone mineral density or osteopenia. In patients with osteoporosis, we found no difference in bone mineral density or age (68.1 (10.4) v 65.8 (10.7); P = 0.42) between those with multiple myeloma or monoclonal gammopathy of undetermined significance and those with no M component in serum. The three patients with multiple myeloma had a history of fragility fractures, compared with 28% (95% confidence interval 5% to 70%) in patients with osteoporosis with coexisting monoclonal gammopathy of undetermined significance and 36% (30% to 43%) in patients with osteoporosis but no M component. Compared with the background population, the relative risk of multiple myeloma in patients presenting with osteoporosis in our clinic was 75 (95% confidence interval 10 to 160). As a diagnostic test for multiple myeloma in patients with osteoporosis, M component in serum had a specificity of 95.0% and a positive predictive value of 17.6%. In practical terms, 122 blood electrophoreses would need to be carried out for each case of multiple myeloma diagnosed. If lymphoma was included as a target condition, the specificity increased to 95.3% and the positive predictive value increased to 23.5%. In a large group of patients with multiple myeloma diagnosed at the Mayo clinic,7 20.0% had light chain disease and 2.8% had non-secretory myeloma. Given a similar distribution of multiple myeloma subtypes, our index test would have a sensitivity of 77% and a negative predictive value of 99.7%. Multiple myeloma and monoclonal gammopathy of undetermined significance are more common in patients referred to an osteoporosis clinic than expected in the background population. Patients newly diagnosed with osteoporosis at our clinic have an absolute risk of 0.8% for underlying multiple myeloma and a 3.6% risk of coexistent monoclonal gammopathy of undetermined significance. Most of these patients have a normal haemoglobin concentration and many have normal erythrocyte sedimentation rates and would be missed by the currently recommended blood tests for patients with osteoporosis. Because of this, we have introduced routine measurement of M component in serum in patients presenting with osteoporosis at our clinic. Despite increasing awareness of the need for diagnosis and treatment of osteoporosis, virtually no data exist on evidence based exclusion of differential diagnoses. To our knowledge the consequences of carrying out or omitting serum protein electrophoresis in patients referred to osteoporosis clinics have not been assessed previously. Our conservative estimates suggest that an osteoporosis clinic caring for 5000 new patients a year may fail to identify 20 cases of multiple myeloma yearly, even with a young patient base such as in our clinic. In addition, 75 to 185 cases of the benign but premalignant disorder monoclonal gammopathy of undetermined significance may be missed. Despite this, few guidelines and recommendations include routine screening for multiple myeloma or monoclonal gammopathy of undetermined significance in patients with osteoporosis, beyond measuring the erythrocyte sedimentation rate. In accordance with the low frequency in the general population,8 we did not observe any cases of multiple myeloma among the 408 people with normal bone mineral density or osteopenia. Monoclonal gammopathy of undetermined significance and even multiple myeloma do not require specific treatment in all elderly patients. When multiple myeloma occurs in younger patients, aggressive treatment prolongs survival.9 Regardless of age, patients with multiple myeloma benefit from early diagnosis. This reduces the risk of developing serious infections and renal and skeletal complications. Some elderly patients with multiple myeloma have major comorbidity, which reduces their ability to tolerate some forms of chemotherapy,10–12 but specialist attention is warranted even in this group to identify and treat life threatening complications.13 Similarly, although the general prognosis of monoclonal gammopathy of undetermined significance is good, affected patients must also be followed because of the possibility of malignant transformation and complications.2 Our study does not suggest that screening for multiple myeloma or monoclonal gammopathy of undetermined significance in osteoporosis clinics would be more beneficial in one age group than in another. Although an M component was more common in patients with osteoporosis compared with people with normal bone mineral density or osteopenia, stratifying for bone mineral density within the group with osteoporosis did not provide additional information. The three patients with multiple myeloma, however, all had evidence of established osteoporosis in the form of fragility fractures, suggesting that measurement of M component may be particularly informative in this group. Referral patterns vary between osteoporosis clinics, depending on national and local guidelines and the general availability of bone densitometry. This affects the predictive value of diagnostic tests. In our clinic, 46% of referred patients fulfilled the World Health Organization definition of osteoporosis. This agrees closely with the 41% to 53%14 15 reported by clinics in the United Kingdom and United States, although slightly lower prevalences are reported by clinics who accept self referred patients.16 The most important limitation of our study was that we could not calculate the false negative rate. To do this we would have had to rule out non-secretory myeloma and light chain disease by carrying out skeletal x rays and marrow biopsies in all patients with osteoporosis referred to our clinic. Given the a pri-ori expectation of a low frequency of multiple myeloma, it is unlikely that ethics committees and patients would have given their consent. It is possible, however, to estimate the number of false negative tests by extrapolating from Mayo clinic data on the distribution of multiple myeloma subtypes at diagnosis. The number of patients with multiple myeloma in our study is a conservative estimate, because we did not assess urine Bence-Jones protein. Light chain disease, however, is less common and the expense would be greater. Thus, about 600 urine analyses would be needed to diagnose a single case of light chain multiple myeloma in patients with osteoporosis if 20%7 of cases of secretory multiple myeloma are of the light chain variant. No studies on the frequency of light chain multiple myeloma in patients with osteoporosis are, however, available to confirm this estimate. We know from other studies that normal bone mineral density does not rule out multiple myeloma,17 18 but owing to the low prevalence of the disease in referred patients without osteoporosis, we cannot make a strong case for vigilance for M component in the absence of osteoporosis. If further studies confirm that the absolute risks found by us are representative, clinical practice may have to include measurement of M component in serum to reliably identify patients with multiple myeloma or monoclonal gammopathy of undetermined significance in osteoporosis clinics. Contributors All authors conceived and designed the study and wrote the manuscript. SSC reviewed patient notes. IA reviewed the pathology reports and haematology notes. JSM provided clinical chemistry expertise and data. KB supervised the study. BA collated densitometry data and carried out the standards for reporting of diagnostic accuracy analysis.19 BA is guarantor. Funding BA is the recipient of a clinical research grant from the Novo Nordisk Foundation. .Lifetime risks of hip, Colles', or vertebral fracture and coronary heart disease among white postmenopausal women.Arch Intern Med1989; 149:2445–8. .The impact of M-component type and immunoglobulin concentration on the risk of malignant transformation in patients with monoclonal gammopathy of undetermined significance.Haematologica2001; 86:1172–9.
. Physician's guide to prevention and treatment of osteoporosis. www.nof.org/physguide/diagnosis.htm (accessed 1 December 2004). .Expert physician recommendations and current practice patterns for evaluating and treating men with osteoporotic hip fracture.J Am Geriatr Soc2000; 48:1261–3.
. Vårdprogram for myelomatose. http://www.nordic-myeloma.org/ (accessed 1 December 2004). .Assessment of fracture risk and its application to screening for postmenopausal osteoporosis.Geneva:WHO,1994. .Review of 1027 patients with newly diagnosed multiple myeloma.Mayo Clin Proc2003; 78:21–33. Cancer incidence in Denmark 1999.Copenhagen:National Board of Health,2003. .A prospective, randomized trial of autologous bone marrow transplantation and chemotherapy in multiple myeloma. Intergroupe Francais du Myelome.N Engl J Med1996; 335:91–7. .Treatment of multiple myeloma in elderly people: long-term results in 178 patients.Age Ageing1996; 25:357–61. .Comparison of melphalan and prednisone with vincristine, carmustine, melphalan, cyclophosphamide, and prednisone in the treatment of multiple myeloma: results of Eastern Cooperative Oncology Group Study E2479.Cancer1997; 79:1561–7. .Tolerability of the cytoprotective agent amifostine in elderly patients receiving chemotherapy: a comparative study.Anticancer Drugs2001; 12:345–9.
.[Treatment of multiple myeloma in elderly patients: consensus of the Geriatric Oncology Working Group of the German Society of Hematologic Oncology and the German Society of Geriatrics].Onkologie2001; 24:386–90. .An analysis of an open access general practitioner bone densitometry service.Int J Clin Pract2004; 58:300–5. .Prevalence of osteoporosis in women referred for bone density testing: utility of multiple skeletal sites.J Clin Densitom1998; 1:5–12. .Interest of a prescreening questionnaire to reduce the cost of bone densitometry.Osteoporos Int2002; 13:434–42. .Evaluation of bone mineral density and fat-lean distribution in patients with multiple myeloma in sustained remission.J Bone Miner Res2003; 18:231–6. .Assessment of bone involvement in patients with multiple myeloma using bone densitometry.Eur J Haematol1996; 57:370–6. .Towards complete and accurate reporting of studies of diagnostic accuracy: the STARD initiative.Clin Chem Lab Med2003; 41:68–73.